An EBF Fillies' Novice Stakes (Plus 10) over 5f on good to firm going. Seven two-year-olds take part, five with race experience and a very competitive heat. 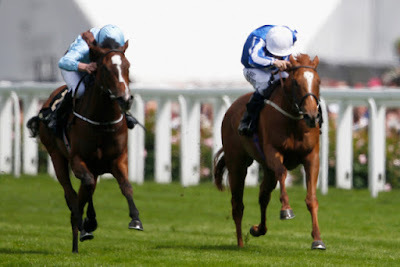 In many respect this race is about one horse and that is the daughter of Frankel - Queen Kindly, trained by Richard Fahey. Frankel has proven to be an outstanding first-season sire, which isn't too much of a surprise because you can guarantee connections have been meticulous in their breeding program to the point I very much doubt inferior juveniles would be allowed to race [quite a controversial point but it wouldn't be a surprise to here that lesser horses are bought back to protect this financial interest]. Queen Kindly is out of an exceptional mare - Lady Of The Desert. She was trained by Brian Meehan. A multiple winner, she achieved Group 2 success and placed at Group 1. Queen Kindly was made 2/5f racing over course winning readily. To be fair that was a pretty ordinary race but her owner, Jaber Abdullah, had higher expectation when this January foal was send to Royal Ascot second start when stepping up to 6f in the Albany Stakes Group 3. She ran a huge race to finish third losing by less than one length. This horse will start very short price here and the tissue odds are 1/5f. Clearly, that is a short price. She has to carry a penalty and it will be interesting to see how this drop back to the minimum trip will suit especially on this faster going. Clearly the horse to beat although not really a betting proposition for most punters. This race features fair opponents who are not here simply to make up the numbers. Micky Hammond may not be a trainer most associate with two-year-old winners but he is a shrewd handler and the stable purchase a select few breeze-up purchased each year rather than breaking horses themselves. One thing you can state about any trainer worth their salt is that they all have their day. *Angel Meadow made a few punters very happy when touching 100/1 and backed to 66/1 when running on to win at York over the minimum trip. This chestnut filly is a daughter of Mayson and purchased by the trainer for £30,000. She stepped up in distance and grade when racing on heavy ground at Newmarket over 6f. This bay filly failed to settle and did well to finish less than six lengths behind Nations Alexander. In truth, that was a difficult race to assess. This drop back to the minimum trip may not be a bad idea if she remains a little too keen although may struggle for pace and run on at the finish. Jeany makes her second start here for Bryan Smart. This daughter of Kodiac was a relatively cheap breeze-up purchase at just £16,000. She was half fancied on debut returning 9/1 SP and beaten by just over one length at Beverley. I like Smart's juveniles second start but even with a weight advantage over the two major protagonists may find this a tough nut to crack. The betting is important here and if priced 13/2 & less SP would register as a strong challenge especially for the place. I very much doubt that will happen and if weak in the betting may have to settle for a bold run but may struggle to win. Nifty Niece will need to improve and other appeal. Yorkshiredebut has shown promise on her first start and then behind Micky Hammond's Angel Meadow second start. This chestnut daughter of Sir Prancealot pulled too hard that day and is another who needs to settle to show her true potential. This looks a stiff ask although I can see this £12,500 yearling purchase winner this season it will be a surprise today at 40/1. The two debutantes will need to have lots of ability and fit as a flea to trouble the favourites. David Brown can go well with his debutantes especially so when fancied in the betting, although they can sprint the odd surprise. *Sky Gypsy is a grey daughter of Dandy Man and home-bred, which can sometimes mean juveniles are a little slower to learn the ropes. I would have to take a watching brief. Last but not least are our friends Ontoawinner syndicate who have Violet Mist trained by Ben Haslam. I often think Haslam is under rated but trains in a very similar style to his father, Patrick. This Irish-bred bay daughter of Coldovil is a 27,000E breeze-up purchase. I would have to take a watching brief but a horse I would take a closer look second start. Conclusion: Pity this is just two places fro each-way bettors although in truth this looks all about one horse. Queen Kindly is priced at 1/5f and it's hardly surprising that few horses priced at those odds are beaten. There is a slight concern about stepping back in trip on this fast going although I could say the same about Angel Meadow. A watching brief but fascinating race.